OK, things have turned around in my kitchen. My cooking rut is over! My own alfalfa sprouts grew, too! It has been quite busy in the kitchen lately. In the span of a week, we celebrated Valentine’s Day, Rob’s birthday and our (2 year!) anniversary from our first date. Rob has been a sweetie, picking recipes from my Top Recipes from 2011 post so he could make me dinner on V-Day and braved the elements on our anniversary for a special barbecue delight. However, I was positively cooking up a storm for his birthday party. I forged ahead with new recipes, and I can’t wait to share them all with you! But first, let me share with you this delicious curry. I had bookmarked “Plantains and Cabbage with Split Pigeon Peas” after Rob had success with a Caribbean black eyed pea and plantain curry, when I first tried cooked plantains. Rob went a bit heavier on the curry powder, so the dish didn’t thrill me entirely but the plantains were neat. A starchy, sweet banana. 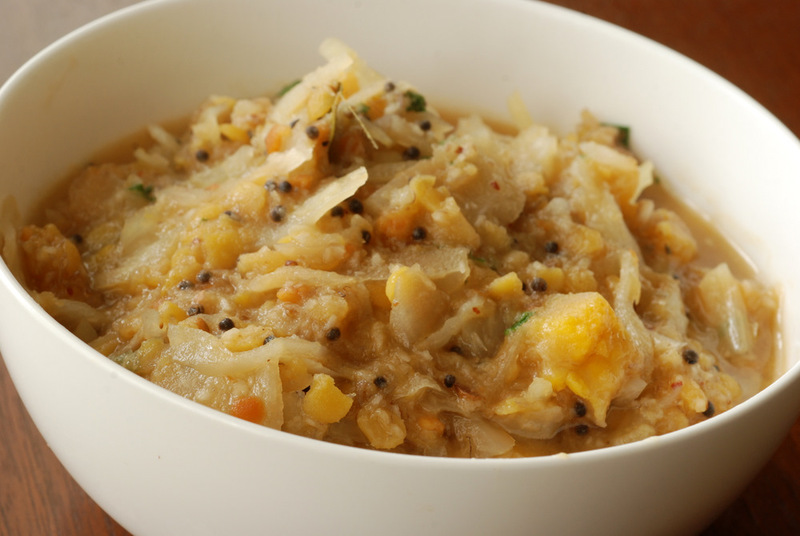 This curry from 660 Curries had many of our favourite ingredients like coconut and cabbage, with new-to-me ripe plantains, and it had been a while since I had cooked with creamy toor dal. Plus, I was drawn to Iyer’s recipe blurb where he wrote: You will be eloquent in your praise and use highfalutin words like “yum”. Highfalutin! Yum! And no, he does not lie. This was delicious and possibly one of my favourite curries to date. Did you know you can buy frozen coconut? It is a common ingredient found in Asian grocers – check it out! While you could substitute reconstituted dried coconut, I think that the frozen coconut played a key element of the success of this recipe. In the summer, Rob and I had a fun time (literally) cracking open a fresh coconut. I used a big knife to shave off the outer skin, and then scored a circle to open it. I tried to smack it open with the heel of my knife but it didn’t work. Rob then took said coconut to the front porch and smashed it against the front step to crack it open. We then took turns sipping the coconut water through a straw. Bliss. I ended up using the coconut flesh for an Indonesian black eyed pea salad with a tamarind dressing. But I like to plan for success. So in case we couldn’t open the coconut, I bought frozen coconut as a back up. Suffice it to say, it has been in my freezer since the summer. Since we have a move looming in the next few months, I have been trying to clean out the freezer. I finally busted it out for this recipe and I couldn’t be more thrilled with the results. This is a delicious curry, and as I made it, I couldn’t help but remember Aarti’s butternut squash, coconut and lentil stew that Rob made in the fall. I consider Iyer’s recipes quite authentic, so I was wondering whether Aarti’s was an Americanized version of the dish since it seemed so similar. Nope, the recipes are similar but quite different in their own merits. 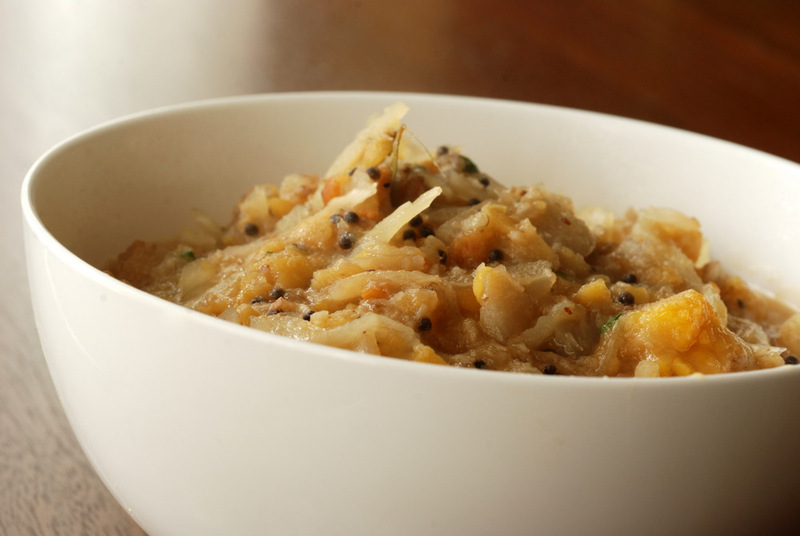 However, if you loved Aarti’s stew, then you’ll adore this version. Likewise, if you like this stew, definitely give Aarti’s stew a try, too. As I type out the ingredients, I realize that they seem so isoteric. For those in Toronto, a trip to Sunny’s (or your favourite Asian grocer) is all you need*. I can’t remember if I’ve seen Aleppo at Sunny’s, but any chile pepper will do. You may have to wait for your plantain to turn a macabre black, but trust me, this will propel anyone out from their cooking rut. *While you are at it, pick up some canned young jackfruit in brine for my next (super awesome) recipe from Rob’s party!! For all the raw foodies out there, do you know if the frozen coconut can be used for all the raw desserts that call for fresh coconut? This is my submission to this month’s Bookmarked Recipes, to this week’s Weekend Wellness. and to Deb for this week’s Souper Sundays. 1. Rinse 1/4 cup pigeon peas (toor dal) in a medium-sized saucepan. Add water, drain. Do this 3 times until the water is clear. This is more important if using the oily toor dal. Add 1.5 cups of water, the cabbage and plantain. Bring to a boil, uncovered over medium-high heat. Make sure the peas are submerged. Mine was a tight fit. Reduce heat to medium-low, cover and simmer for 20-25 minutes until the peas are soft and the veggies are cooked. If you are using split peas, this could likely take 60 minutes instead. 2. Meanwhile, heat a small skillet over medium heat. Add the oil, remaining tbsp of toor dal, coriander seeds and chili flakes. Stir fry until the chiles darken and everything becomes aromatic, around 1 minute. Keep the oil in the skillet but remove the peas and spices. Add the spices to a food processor and pulse until it is as ground as you can make it (I used a mortar and pestle first but it didn’t do us any good… the toor dal was never become ground, even in the food processor. I was too scared to put the oily spices in my spice grinder.. but it all turned out ok with the food processor). Add the coconut and water and blend until you get a smooth paste (it will still be gritty from the spices). Scrape the sides as needed. 3. Reheat the spice-kissed oil (love that term!) in the skillet over medium-high heat, and add the mustard seeds. Cover the skillet and cook until the seeds have stopped popping, about 30 seconds. Add the oil and popped mustard seeds to the cooking peas, cabbage and plantain. Add the curry leaves, salt, half the cilantro and the coconut paste. Rinse out your food processor with 1/4 cup of water to get all the coconut goodness. Stir the curry a few times. 4. Cover the pot and simmer the curry over medium-low heat for an additional 5 minutes to allow the flavours to meld. Garnish with the remaining cilantro. Yessss! Something awesome to do with cabbage! 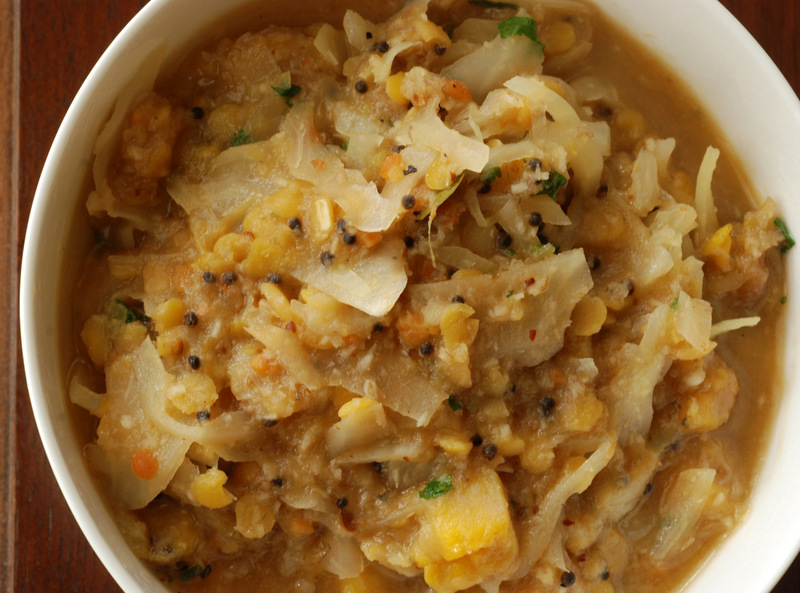 I love creative cabbage recipes and with curry and plantains in there? Yum! Agreed. This curry was awesome. Very tasty. Very deserving of highfalutin words like “Yum”! This dish sounds fantastic. I think I could eat if for dessert! I’m looking forward to that jackfruit recipe. That stuff is delicious! Awww! It is time consuming, but less so if you are starting from canned. I can’t wait to see your creation – I’ve been waiting for them to pop up at the farmer’s market again. comforting at the same time. I adore cabbage, and I’m always looking for new recipes. Thank you for sharing with me…I’m glad I visited your blog this morning. My stomach is grumbling and my mind is inspired. I hope you have a blessed day! I feel like this post was written just for me – I loved Aarti`s stew, so now I know that I would love this one too! Opening a coconut is definitely hard work and a learning experience, but so worth it! Can`t wait to see your jackfruit recipe too! Wow it really has been a crazy two weeks for you! Did you know that I’m a sucker for anything that calls for sweet plantains? Cause I SO am. This looks and sounds amazing! Wow okay I thought it was a lot to have our dating anniversary, Valentine’s and E’s birthday in 1 month but you guys do it in 1 week! I did not know about frozen coconut. I’ll definitely look for it! I was just looking at canned jackfruit the other day but it was in syrup, not brine. 😦 Love the suond of this dish with so many interesting things. I need to look through 660 Curries more often. Looks delicious, flavorful and hearty! I’d love to try curry, it’s new to me.